Emmanuel Ndibo is the Senior Manager responsible for the Fraud Detection function at Safaricom. He joined Safaricom in 2005, working his way up and through the business to have a comprehensive understanding of their risks and how to manage them. 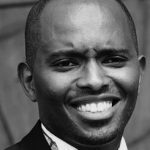 When Emmanuel joined Safaricom he started as a Revenue Assurance Analyst, then became a Senior Auditor in 2008, a Principal Internal Auditor in 2011 and was promoted to his current role in 2014. Emmanuel’s role is part of the Ethics and Compliance department within the Risk Management division of Safaricom. The Ethics and Compliance department is responsible for executing Safaricom’s compliance programmes, managing and coordinating the execution of the control framework by individual business functions and carrying out fraud and assurance activities to ensure Safaricom obeys all laws, regulations, standards and business policies. Emmanuel graduated from Nairobi University with a Bachelors of Commerce in Management Science. He has also attained the CISA, CIA and CCSA qualifications.